It seems like everything starts in the fall. After a summer of free schedules and flexibility fall rolls around and demands order. And planning. And participation. In an effort to hang on to my summertime freedom there was one such event that I had participated in for years that I just decided would be too much for me this fall: Ladies Bible Study. I just wasn't ready. But, wouldn't you know it, the Lord started tugging at me. And then the ladies in charge changed the time (not just for me) to make it more attend-able to those of us who had to pick children up from school before noon (me). And then I read the title of the book: She's Got Issues: seriously good news for stressed-out, secretly scared control freaks like us. Oh, [ahem]. That kinda sounds like me. Truly as I write this I am only a few chapters in, but I know the Lord wanted me to participate in this study. There is work to be done in me. And, if you're honest with yourself, there is probably work to be done in your heart as well. So I thought maybe we could do it together? As I continue to make my way through this book and peer deeper into my soul I plan to journal here, my thoughts and reflections and the work the Lord is doing inside of me. I don't intend for this to be a book report or endorsement or just a minutes report of what went on in weekly Bible Study meeting. I want to be honest about my journey through these issues so you can see the Lord working in my heart and hopefully your heart as well. Misery loves company ;) No, no I'm kidding. What I really mean is that it takes a bit of courage to dive into heart issues and maybe if we do it together we will be more brave about "going there". So stick around. 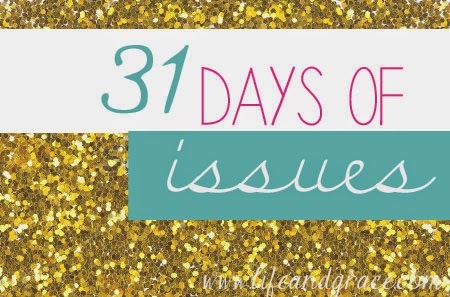 And welcome to 31 Days of Issues.